Sizing 35 inch, 37 inch, 40 inch. 12.8 x 4 x 13 inches. 30-42 inches. Large. 40-42 inch. Regular, long, extra long, 2-extra long. 40-42 inch. 36 inch. 30 to 42 inches. 36 – 46 inches. Weight 2.9 pounds. 3.3 pounds. 4 ounces. 3.1 pounds. 3.5 pounds. 3 pounds. 3.5 pounds. 1.9 pounds. 2.95 pounds. 3.9 pounds. Dimensions 1 x 14 x 18 inches. 36 inch, 38 inch and adjustable up to 42 inches. 11 x 4.1 x 0.6 inches. 14.3 x 10.1 x 3.6 inches. 13.5 x 12 x 3.5 inches. 14 x 11 x 3 inches. 12.8 x 4 x 13 inches. 12.5 x 9.7 x 3.9 inches. N/A. N/A. Safety rating (if applicable) OSHA 1910.266 and ASTM F1897. ASTM f1897, ANSI z133.1 and OSHA regulation 1910-266. N/A. OSHA Regulation 1910.266. OSHA, ATSM and UL. OSHA, UL. ASTM F1897, ANSI Z133.1, OSHA Regulation 1910-266, UL. ULF. UL, ANSI, OSHA. 3-UL Classified, ANSI Certified, OSHA Certified. How to Select the Best Chainsaw Chaps? Whether you’re a seasoned chainsaw operator or you just use a chainsaw from time to time, you should always wear chainsaw chaps. Anything can happen when you’re using the most dangerous power tool on the market. In this buying guide we aim to show you the various chainsaw chaps aimed at professionals and casual users. Not all will be suitable for you, but the key is to find the pair that suits the level of work you will be carrying out, for the right amount of money. There are different kinds of chainsaw chaps to suit different chainsaw users. From the homeowner in need of something light and durable, to the professional who requires a very heavy duty yet less-restrictive option; there’s something for everyone. The type of chainsaw chaps you require will all depend on the work you undertake. Many people in professional lines of chainsaw work prefer the apron-type chainsaw chaps as this allows less restriction in movement, while still giving optimum protection. Chainsaw chaps will inevitably get dirty when worn. After all, chainsaw users are out in nature dealing with not only tree sap, soil and bark, but the grease and grime from their chainsaws as well. So it definitely pays for the chaps to be easy to clean. It’s preferable that they can be thrown in the wash or just hand washed with a damp cloth. If you happen to damage your chaps, a safer alternative to repairing them is to just replace them. Any weakening in the structure of the champs greatly reduces their ability to keep you safe. A quality pair of chaps will last a long time. They will be made out of quality material such as 1000 denier polyester, and they will have extra strong seams to prevent tearing where there shouldn’t be any. Manufacturers can’t afford to skimp on quality. A low quality pair of chainsaw chaps can be the difference between serious injury and walking away unscathed. You should always opt for quality over price. 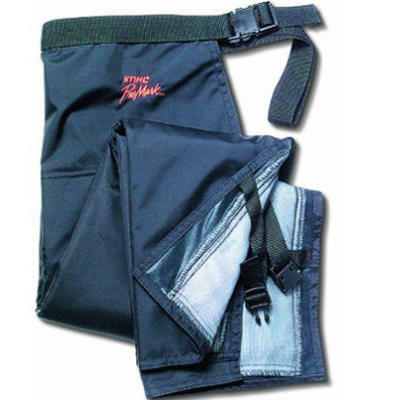 Each manufacturer or brand offers chainsaw chaps with different features. However, they all aim for the same result: to be as protective as possible. They can achieve this by using material such as 1000 denier polyester and PVC coating with Tek warp protective layers. It also helps when the chaps are lightweight to make moving a little less restricted, and have adjustable waists to fit a wide range of chainsaw users. Manufacturers of chainsaw chaps very rarely skimp on quality either. So you can expect good, strong components such as acetyl Delran buckles and heavy duty seams. You may have a budget in mind for a new pair of chainsaw chaps, but that budget should never mean you have to choose a lower quality pair of chaps. Because your safety out in the field is paramount, you should always opt for a top rated pair of chaps with good reviews. Within this buying guide we will show you those top rated options that will more than likely be within your budget. The best deals for chainsaw chaps can be found online on websites such as Amazon. They can be less restrictive than arborist chaps. They are often more affordable than arborist chaps. They offer premium frontal protection. There is no protection in the rear. They can be uncomfortable to walk in – depending on the weight. Type A chaps are designed for chainsaw users primarily on the ground. They are generally not suitable for arborists who need all-round protection. Type A chaps offer full frontal protection for ground users in all kinds of settings – from the backyard to a forest block. Type A has many features which mainly focus on the frontal area of the chaps. The material is generally 1000 denier polyester and is tear-resistant with good stretch qualities to make it easier to walk. A lot of focus is normally put on cut protection fiber which will come apart from the chaps when hit by a chainsaw and will block the chain. This will, in effect, stall the chainsaw. They also feature heavy duty seams to prevent them from coming apart easily under pressure. Only the highest quality materials are used in the creation of type A chainsaw chaps. This is to not only ensure they stand the test of time, but also the pressures of an environment which requires top quality safety equipment. All seams are double stitched and all materials are heavy duty and extra strong. This ensures nothing comes part when it shouldn’t, compromising the safety of the wearer. They offer protection that goes all the way around. They are generally more lightweight than a ground chainsaw user’s chaps. They have more pockets and features than type A chaps. They are aimed at mainly arborists and climbers but they should also be aimed at standard ground chainsaw users as well. They are generally more expensive than type A chaps. 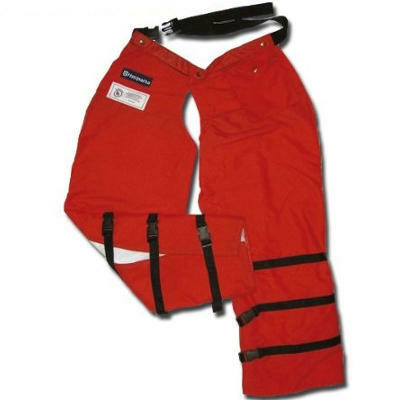 Type C chainsaw chaps are aimed at arborists, rescue workers and climbers. This means they are more suitable for those who spend more time off the ground than on it. Although, that’s not to say ground users of chainsaws cannot purchase these. They are just not as suitable for homeowners as they are for industry professionals. Type C chaps tend to be packed full of features not found on type A chaps. They are more lightweight, they have better stitching, the fabrics are often breathable and they have reduced stitching in the knees for better mobility. They also feature raised backing with padding and plenty of pockets for tools. Type C chaps are easy to wipe clean, and are made of quality materials in order to be durable for many wears. They have solid stitching which very rarely comes apart and are constructed of thick material which doesn’t rip or tear easily. They come in several different colors. They are water and oil resistant. Some users say there is no upper leg or crotch protection due to the split up the middle. The waist adjustment strap doesn’t stay tight. Some users say the clips can break easily. Sizing: 35 inch, 37 inch, 40 inch. Dimensions: 1 x 14 x 18 inches. Safety rating (if applicable): OSHA 1910.266 and ASTM F1897. QDo these chaps meet ATSM standards? AThey are OSHA and ANSI approved. QWhat is the composition of the material? QIs there a waist extender? ANot as standard but you can contact the manufacturers to have one added at an additional cost. These chaps meet the mark as reliable, comfortable and most importantly safe. They are easy to put on and take off, and meet several safety standards. They also offer plenty of leg protection with kevlar material and are very affordable. 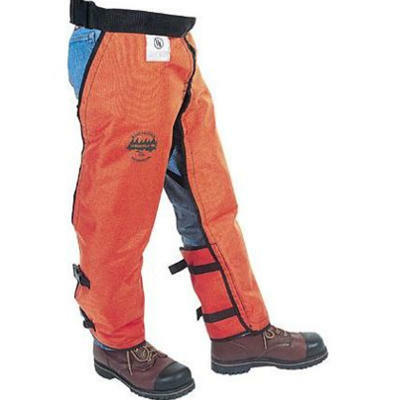 These top rated apron chaps are undoubtedly some of the best chainsaw chaps for the money. Check out what other people who purchased this product think about it. 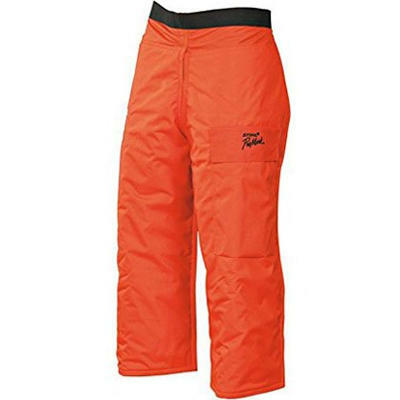 Read Forester chainsaw chaps reviews. They have 1000 denier polyester as protection. They have PVC coating with Tek warp protective layers. They have an adjustable waist. They are bright orange for better visibility. They have a gear and felling wedge pocket. They are too hot for warmer states. The pockets aren’t well placed so can’t hold much, if anything. The strap pulls aren’t well designed and can be hard to pull. Sizing: 12.8 x 4 x 13 inches. Dimensions: 36 inch, 38 inch and adjustable up to 42 inches. Safety rating (if applicable): ASTM f1897, ANSI z133.1 and OSHA regulation 1910-266. QHow many layers of Tek warp do these pants have? QAre they protective for electric chainsaws too? AAlthough some protection is better than none, they are more specifically designed for gas chainsaws due to electric chainsaws having higher torque and no automatic shut off feature. QDo these have fibers in them that wrap up and stop a chainsaw when cut? 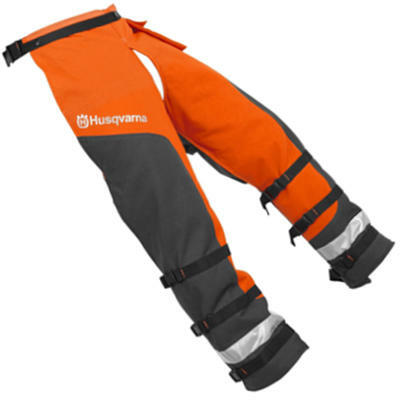 These Husqvarna protective trousers in an ‘apron wrap’ design are effective at protecting chainsaw users from accidental contact with a chainsaw chain. They are manufactured with tough 1000 denier polyester and Tek warp, and effectively meet the needs of most chainsaw users. However, they are heavy which means they trap heat inside them. For users in hot climates, they may prove to be very uncomfortable. A more breathable arborist’s trousers may be a better option. These chaps are also a lot more expensive than some other brands so it pays to shop around online to see if you can get the best deal. Check out what other people who purchased this product think about it. Read Husqvarna 587160704 chainsaw chaps reviews. They are lightweight yet offer heavyweight protection. They’re a vibrant orange color for better visibility. You can choose to have either 6 or 9 layers of protective cut-retardant material. They have an open-back design for working in hot conditions. There’s a large pocket on the front for tools, phones and accessories. They don’t appear to be as durable as some other brands. They aren’t as affordable as what other manufacturers have to offer. Dimensions: 11 x 4.1 x 0.6 inches. QHow long in the leg are they? QWhat waist size do they fit? QWhat protection do they offer? A6 or 9 layers of Entex cut-retardant material. Sometimes you can pay a lot for a product just because of its brand. This potentially could be a prime example. 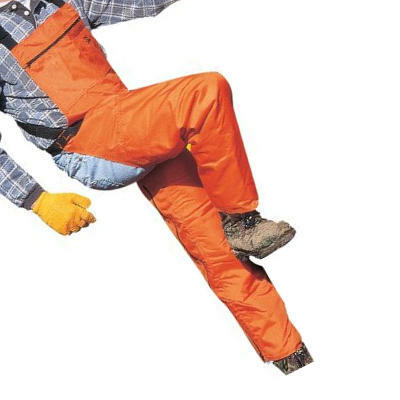 These pants, although very safe and protective for chainsaw users, are available at a much higher cost than other brands. Specs are very similar to other brands but they also don’t appear to be as high quality as what others are on the market. Overall, they aren’t the best chainsaw chaps for the money, nor are they top rated. Check out what other people who purchased this product think about it. Read STIHL chainsaw chaps reviews. They have knee pads which provide kneeling support. They feature cut-retardant material sewn into the legs. They are easily worn over boots and clothing. The bright color makes them easier to see out in the field. They protect the torso when many brands don’t. They are not as heavy duty as they look. They have a larger price tag than lesser known brands. There are huge price disparities when purchased online vs. instore. Dimensions: 14.3 x 10.1 x 3.6 inches. Safety rating (if applicable): OSHA Regulation 1910.266. QWill these protect against electric chainsaws? ANo. Electric chainsaws have high torque and do not have an auto-stop function. QHow are they designed to work? AThe fibers in the pants rip apart when put in contact with the chainsaw’s chain. These fibers are intended to clog the sprocket which can help stop the chain. AYes. Unlike some other brands, you can wash them in a household washing machine. STIHL has produced these chaps to be more functional and safer than ever before. They have several levels of protection such as knee pads and cut-retardant fabric, as well as protecting the torso when many other types do not. They are also comfortable to wear, are easily visible and fit well over top of clothing and boots. The only true downside is the price. Not only are they very unaffordable to the average buyer, but there’s huge disparities in price when purchased online or instore. They have an orange 1000 denier cordura shell. They have a multi-layer warp knit blend with protection on the front, sides and full calf. They are adjustable in length with snap extender. There’s big price disparities between online and instore. Some users have reviewed them and said they feel cheaply made. Dimensions: 13.5 x 12 x 3.5 inches. Safety rating (if applicable): OSHA, ATSM and UL. QDo they have protection at the back? QWhat environment are they best suited for? AForestry blocks and backyards. They are very versatile. AHand washed and hung to dry. These chaps represent good value for money, however there’s big price disparities between buying online and instore. In order to get the best deal it’s recommended you shop online on websites such as Amazon. These chaps meet the mark for safe and effective protection against accidental cutting. They have multi-layer warp knit blend on the front, side and full calf, as well as a 1000 denier cordura shell. They are well designed and suit a variety of chainsaw users. Overall they are easily some of the best chainsaw chaps for the money. Check out what other people who purchased this product think about it. 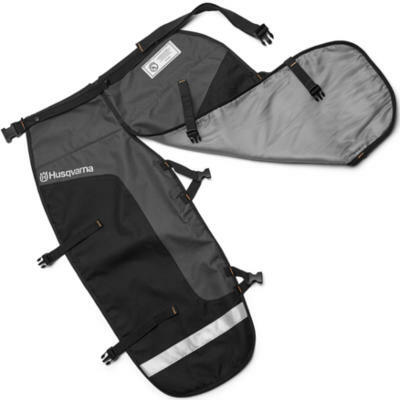 Read Husqvarna chainsaw chaps reviews. All components including the buckles are very well made. They fit securely and don’t move around too much. The cordura outer-liner gives good brush deflection and is very durable. They are protective in the wet weather. They don’t have stitching in the crotch area which could have added more protection. They are a little on the heavy side. They only have six layers of protection whereas many brands offer 9. Sizing: Regular, long, extra long, 2-extra long. Dimensions: 14 x 11 x 3 inches. Safety rating (if applicable): OSHA, UL. AIf you live in a hot climate you may experience some heat discomfort. Although they are on the higher end of the price scale, these chaps sure do give good bang for your buck. They are exceptionally well made, are OSHA and UL certified, and have several layers of protection to keep you safe out in the field. This includes 1000 denier orange cordura which is resistant to snags and tears as well. They are bright for easy visibility and are comfortable to wear. They could do with a little extra protection in the crotch, but reviews have been positive and it’s clear to see why. These Labonville chaps truly are some of the best chainsaw chaps for the money. Check out what other people who purchased this product think about it. Read Labonville chainsaw chaps reviews. They offer good protection with 600 denier polyester, PVC coating and Tek warp protective layers. They are wind and water resistant. They meet several safety ratings. They are not easily visible in a forest environment. Dimensions: 12.8 x 4 x 13 inches. Safety rating (if applicable): ASTM F1897, ANSI Z133.1, OSHA Regulation 1910-266, UL. AThey are cold water washable. AThe PVC coating on the front helps stop them getting wet – but there’s no back protection. AThe cut-retardant material is designed to shred and clog up the sprocket which should slow or stop the chain from moving. These Husqvarna chaps are very well priced on the market. They also offer ample protection for chainsaw users of any level of experience. Designed to be convenient for the user, they have an adjustable waist, are relatively wind and water resistant, and are easy to put on. However, they are quite heavy which can cause user fatigue, and they are also not very visible in forest environments. But they are an affordable and safe option which has been well received by many purchasers. Check out what other people who purchased this product think about it. Read Husqvarna Functional Apron chainsaw chaps reviews. They are half as heavy in comparison to some other brands. They are affordable – but on the higher end of affordability. They are made of 400 denier nylon. All straps are easily adjustable. They only have 6 layers of cut-retardant material when other brands can offer 9. They aren’t as visible out in the field as the fluro colors on offer with other brands. Dimensions: 12.5 x 9.7 x 3.9 inches. Safety rating (if applicable): ULF. QDo they come available in other colors? AWhen contact is made with the cut-retardant material, it shreds and clogs up the chainsaw sprocket. This helps to slow down and/or stop the chainsaw. A36 inches from the top to the bottom. 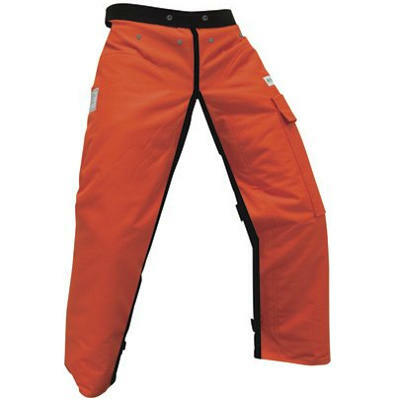 These STIHL chainsaw trousers offer less protection than other chaps on the market, therefore they cannot be rated as some of the best on the market. The material is only 400 denier when many others offer at least 1000. It also only has 6 layers of cut-retardant material when some other brands offer 9. Even when aiming to be lightweight, it pays not to skimp on quality. Many users note they feel more lightweight and therefore less protective. Even though they are well priced, they are still priced towards the higher end of the market which can put them out of reach for some people. They offer 12 layers of durable polyester for protection. They have a large pocket in the front – many brands don’t offer pockets. They are bright orange for good visibility. They are designed to reduce damage, not fully prevent it. They do not have any kevlar material in them. Sizing: 30 to 42 inches. Safety rating (if applicable): UL, ANSI, OSHA. QDo they wrap fully around the legs? 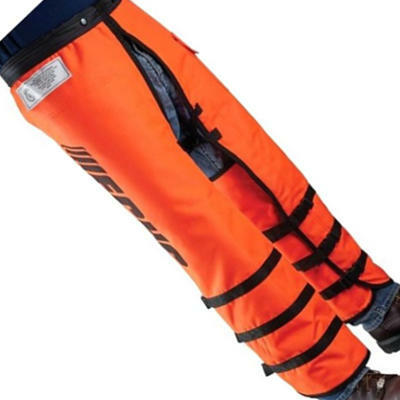 Although they are a product from a lesser-known brand, these chainsaw chaps will help reduce any damage caused by misuse of a chainsaw. The 12 layers of protective polyester is ample protection and works by clogging up the sprocket of a chainsaw to slow or stop the chain from moving. These chaps are very affordable and suit homeowners very well. They are probably not intended for everyday use in a professional setting. They are top rated by homeowners and for this reason can easily be be considered some of the best chainsaw chaps for the money. Check out what other people who purchased this product think about it. 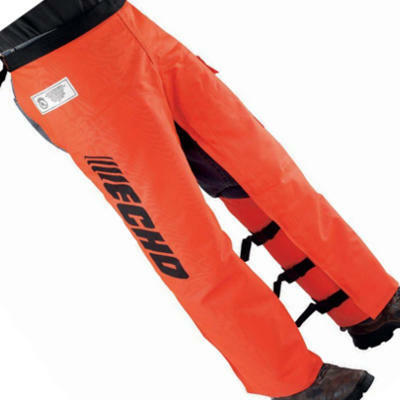 Read ECHO chainsaw chaps reviews. They offer 12 layers of polyester material. The waist clip adjusts to 46 inches. They wrap around the calf for extra protection. They don’t offer the same level of protection as more well-known brands. Sizing: 36 – 46 inches. Safety rating (if applicable): 3-UL Classified, ANSI Certified, OSHA Certified. QDo they have full wrap leg protection? Although these chaps are affordable for many people, they lack features which make wearing chaps a lot more convenient. They don’t have a PVC coating which means they get wet and oily very easily. They also can’t be washed which means any oil spilled on these chaps is there for the duration. They also offer less protection than other brands. However, they do have full protection around the calf area and are easy to see in low visibility settings. They aren’t top rated but for the money they do help protect your legs from chainsaw accidents. Where to Buy Chainsaw Safety Chaps? Chainsaw chaps can be purchased instore and online. However, due to huge price disparities between products for sale online and instore, you can easily get the best deal online.